So, it’s come to my attention that some people don’t even know what Google Reader is, and probably don’t really get what this whole Bloglovin thing is all about. Google Reader and Bloglovin are both feed readers. Here’s what that means. Way back when, I would find a great blog and bookmark it. But then, when I wanted to check if the blog had updated, I had to check each bookmark. At first, not a big deal… but eventually, I was following about 20 blogs and checking them one by one got to be too much. Even more frustrating, I’d check each blog individually to find that only some had been updated. That’s when I found out about feed readers and started trying out Google Reader. From then on, when I wanted to check my blogs, I could pull up one site and ALL of the new blog posts would show up in that one spot. That’s what a feed reader does- it checks every blog for me and brings all the updates to one page. 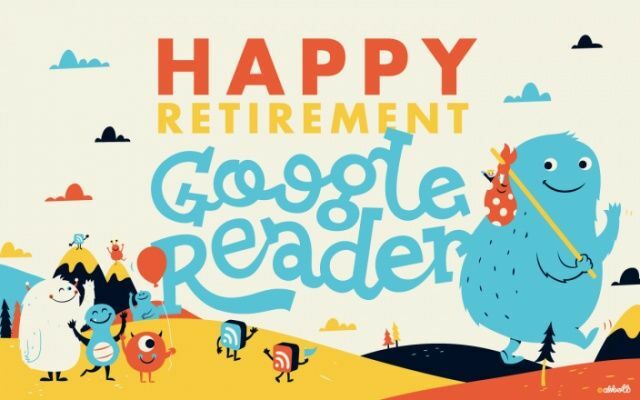 Now, Google Reader is going away on July 1st. I’ve been trying out new feed readers to see what’s going to work for me. A lot of teacher bloggers are switching to Bloglovin. The layout is clean and easy, and gives you a quick preview of each post. As a blogger, I like that I can see how many people follow me on Bloglovin and I like that when someone views my post, I actually get a pageview so I know someone read my post. As a blog reader, I really like the Bloglovin app, but unfortunately the desktop site takes a lot more clicks to navigate if you want to read full posts. Now that I don’t have an iPad or smartphone (at least for now! ), I’ll have to depend on my laptop for blog reading, so that’s important. Instead of using Bloglovin, I think I’ll be switching to Feedly. It’s another feed reader that doesn’t look quite as cute and modern, but it’s still clean and easy to use. It’s also VERY customizable. Feedly (and its app) make it easy to set up groups (so I can put my non-teaching blogs in a separate spot, or my favorites in another). I can also choose different views- just the title, a preview, “magazine view,” or the full article view (which I chose above, because it’s what I prefer!). My favorite feature? A “save for later” flag at the bottom of each post. Makes it easy to save really great posts for a later read (or to go back to and add comments, link up, etc. when I have more time). There’s also Pinterest integration for pinning right from Feedly, without needing to open the blog in a new tab. LOVE! With both of these feed readers, you can import your Google Reader blogs in one click. I did find that Bloglovin only imported my unread items and Feedly didn’t seem to know which 500ish posts I hadn’t read yet. I think both Bloglovin and Feedly are serviceable feed readers that make blog reading MUCH easier than visiting each site individually. But there are other feed readers, and even a few other ways to follow blogs. If you want the blog to automatically email you when a new post is put up, you can sign up where it says Follow By Email. Word of caution, though- usually come a few hours late, so I hear that sometimes email followers miss flash freebies and quick giveaways. I also know a few people who follow strictly through blog Facebook pages. This can be a great way to follow blogs, but another warning- Facebook won’t automatically show you every time a page updates unless you tell it to. If you do choose to follow, go to the blog’s Facebook page and click where it says “Liked” on the top right. Make sure it says “Show in News Feed” and then choose “All Updates” to make sure you see them all! Of course, you can always just bookmark blogs, but if you get to reading more than a few (… or a few hundred, like me), feed readers are by far the easiest way. Make sure if you are using Google Reader, you switch to another service like Bloglovin or Feedly by TOMORROW, July 1st. If you want to keep reading my blog, you can click below, stop by my Facebook page, or follow by email on the right sidebar. How do you prefer to read blogs? Currently… Life’s a Bit Upside Down! My classroom is looking sadder by the day, but I’m getting a lot of things organized before packing, which I’m hoping will pay off! Although seriously, after seeing the sheer number of flashcards, mini pocket charts, and book bins, I should own some stock in Target and Dollar Tree by now. My husband has started his new job, and we have one more week until we’re moving everything out of our current place. So, of course, there's a lot to do… but I’m taking a break for Farley’s Currently! loving: Do you ever get together with your class during the summer? I invited my last two years’ classes to stop by the library a few nights ago to say hi before I move away, and a lot of them came. It was so great to hear about their summers, what they’re reading, and see them one more time! wanting: Seeing my kids again just makes me want a job even more. I’ve got that antsy feeling of wanting to get ready for next year- but I have no idea if I’ll even have a class next year. My husband and I would be okay without me getting a teaching job… but I love my job, and it would definitely help out my family, too. needing: Yesterday, I packed up my classroom library, and the room is finally starting to feel very empty. There’s still a lot to do, but it’s getting there. I’m just sad to leave this place! tips, tricks, & hints: This month I offered a 2013-2014 calendar for free on my Facebook page and went from 9 followers to 1100 in a matter of weeks. Definitely a great move. Plus, once I took it down as a freebie, I’ve sold a few copies in my TpT store, so I’ve finally become an official seller! Woohoo! Anyway, life is crazy. I know everything will work out… it’s just the wait that’s driving me a little crazy! By this time next week, at least the moving will be done- and I can focus more on job searching, getting to know my new area, and making a new fan freebie for all of you! I love using math journals. They are such a great way to encourage perseverant problem solving and using different ways of thinking! (Hellooo, Common Core!) I'm linking up with Throwback Thursday to share a post from June of last year. Don't forget to pick up the freebie! Click on the photo to read all about it! 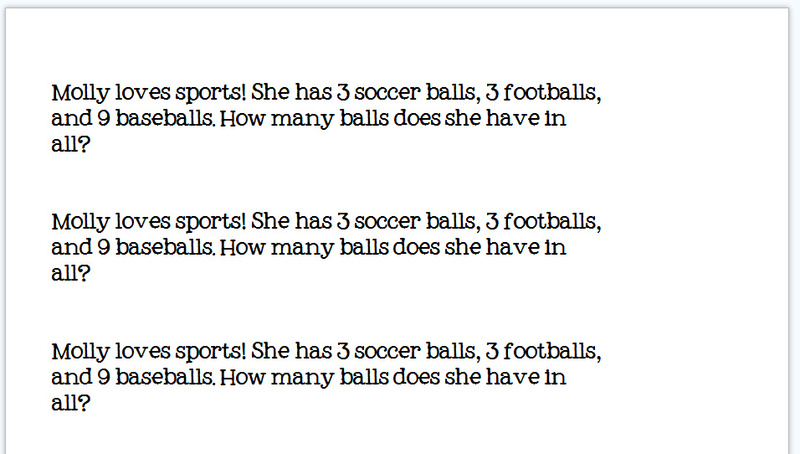 When I was little, we learned strategies for "word problems." Usually, we would practice two or three that followed a certain pattern to solve, and then we would have an assignment that followed the same pattern. Sometimes we learned "clue words" that would tell us, supposedly, which pattern to follow. 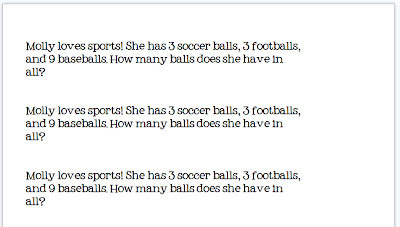 But they were inconsistent- "more" could mean adding, but in the case of "how many more" it could also mean subtracting. And I didn't know why I should subtract when it said "how many more"- it was just an arbitrary thing I had to remember. Everything else came pretty easily to me, but math took some work, and Elementary Jenny did NOT like that. And then I got to middle school, and took pre-algebra. My teacher, Mr. Wall, was phenomenal. He was an old-school teacher with high expectations, but he also put more time in with his students than just about any academic teacher I ever had. If you ever needed help, or wanted his help studying for a test, he would come in before or after school to help you. And every Wednesday morning, he hosted MathCounts in his room. If you came, more often than not he would bring donuts. If you've never heard of MathCounts, it's a program specifically designed to challenge kids with tough problem-solving questions. But- Mr. Wall knew how to make it fun. He'd give us a page with 15 impossible problems, and if you got 2 or 3 right, that was a good day! And somehow, he made us believe that. These weren't problems that followed a pattern- no, these were problems that you might have to try 3 strategies to figure out, and you still might not get it. He would always let us try it (even if it was the wrong way), and after awhile might give hints to get us going in the right direction, but he never gave up and told us how to do it. And if someone else in the group managed to solve one we were stuck on, that student could tell us how they figured it out. They were puzzles, using all different kinds of math, and we would spend an hour pushing ourselves to figure out the puzzles. Because they were so hard, and there was no formula, and we were doing it without the help of the teacher, when you did get one, it was the most amazing feeling. And, that year, I realized that maybe I wasn't so bad at math. Yep- puzzling away at tough problems and getting maybe 3 out of 15- and that's the year I realized I could do math. Mr. Wall was that teacher who changed me as a learner. We've all had one. But here's how I take that and make it change me as a teacher. We made our math journals during the first week of school. I cut construction paper to the size of a composition notebook cover, and then walked them through the steps. I was very detailed so that the title would be easy to read (or because I'm a control freak- not sure). First, you write "So-and-So's Math Journal" in the middle with red. Then, you use blue to make a cloud around the words. Finally, you use different colors to write what you think of when you hear the word "math." I show them my example, and I tell them they can be different names for a number, math tools, shapes, math units, symbols, math words, time, money, measurement, ten frames, fractions, base ten blocks... anything that is "math." And then, we store them in these shower caddy things with our science journals (so that when math journal time, one kid goes to get the bin for his group). The first few times, we work through problems together and I model multiple strategies. There were 7 ducks and 9 geese at the pond. How many more geese than ducks are there? Well, some of my students used 9-7 = 2. Some of them drew ducks in one row, and geese below and saw that two didn't have partners. Some used 7+2 = 9. One thought that if you had 9 you would have to take away 2 for the number to be equal. Another drew two unit bars, one for ducks, and one for geese, before subtracting. And guess what? They all got the answer: 2 more geese. Many of us probably have an "author's chair" or time for sharing in writer's workshop- but how many of you have a time for your mathematicians to share their thinking? Even with a simple problem, I like to say, "How did you solve that? Great! Who used a different strategy? What was your method?" (and I make a point of using those words so that they don't startle my students on a test.) A document camera is fantastic for sharing their work. My students start to look for other ways to solve something, because they know a variety of strategies are valued. They're not looking off of their neighbor as often, because they know their work doesn't have to be the same. My students are much more eager to attack a new problem when they know there isn't a certain "right" way. They will also try something they've never been "taught" before (like multiplication or division problems for my 2nd graders) because they're not afraid to just try. They know I won't get mad if they don't get the right answer, or don't get an answer at all. They know they are "making their brain stronger" when they take on a challenge, and that I will appreciate their effort no matter what. It's not a perfect method, of course- you'll still have students get stuck, or frustrated, from time to time. But the overall attitude towards math in my classroom became so much better when I started encouraging multiple ways to solve the same problem. And the best part? They're building number sense, skills, and confidence to solve not only problems in the next grade, but problems in the real world. To get you started, here's a week's worth of math journal prompts. You can get the PDF and keep the cute font here, or get the Word document (and insert your students' names for better engagement) here. All you need to do is print the number you need, cut off the right edge (if you use a composition book, anyway! ), and cut into strips. She's taught kindergarten and fifth grade, so there's a little something for everyone. This is my third time searching for a teaching job- first after college, then after a Reduction in Force, and finally after a move out of state. Third time in 5 years, and I’m finally figuring out how to keep everything more organized this time! So… here’s the start of a new series for anyone out there also job searching in the education field. 1) When you’re applying, make sure to have everything you might need on your computer in one folder. Make a list. Yes, in a metro area, this is daunting! Create a new folder of bookmarks. I like to do this on the toolbar, so that it’s easy to access on a regular basis. Then, make bookmarks of every different employment page (some will share the same system). In Firefox, at least, you can do this by dragging the logo on the tab and pulling it over to the bookmark folder. I also bookmark a couple of general teacher job sites. My favorites for here in the Midwest have been www.schoolspring.com and www.k12jobspot.com – any other suggestions? 4) Every day or so, check the sites in one click (Open All in Tabs). They’ll each open in their own tab, and you can close each one after you check it for new vacancies. 5) Of course, once there are openings, you have to start applying. Thankfully, a lot of school systems in my new area have decided to use a common application (which makes things SO much easier!). Unfortunately, each application usually requires you to retype your entire resume’ into a new format, and then some. Have your resume open for easy copy and paste, and a new document for application question/answers. I copy and paste the question into Word and then type my answer there so that I get the full advantage of spell check, the thesaurus, etc. Check that everything transfers correctly (quotation marks and tabs seem to have trouble converting), but then it’s also easy to save your answer in case another application asks you to answer something similar. 6) Track where you’ve applied and when. I keep a notebook of all of my completed applications, with date, district, and school (if given). This makes it easier to follow up later… and makes me feel accomplished when I’ve turned in tons of applications but haven’t heard anything back yet. Don’t forget to put your username and password at the top of each application site. Every site is a little frustratingly different on what they require, so write them down now and save yourself the stress later! 7) Finally, don’t underestimate the value of face-to-face networking. A lot of applications go straight to Central Office, so I like to make a packet to bring by to the principal, when possible. They’re usually the one making the hiring decisions, at least in my experience, and even if I just get to smile and be polite to the secretary, it might help! A lot of work? Yes. But in my area of the country, principals are sometimes getting hundreds of applications for each position. You want to stand out and show them why they should consider you. 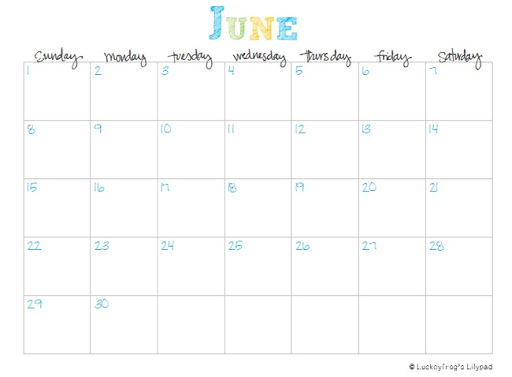 Have you downloaded my free printable calendar for June 2013- July 2014 yet? Only free until I wake up tomorrow and change it, so make sure you "like" my Facebook page and snag your fan freebie! 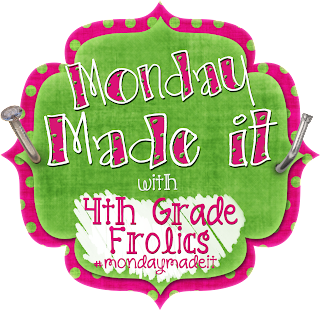 I’m so excited to link up for my first-ever Monday Made It with a free printable 2013-2014 calendar for the school year! Read on to find out how you can get your copy of the July 2013-July 2014 calendar. Today’s tips are about getting organized during the summer. 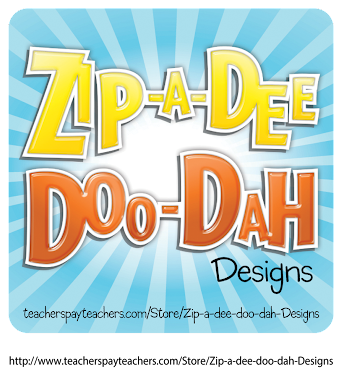 - Make a file folder for each child in your class. I number these instead of putting names- a little more anonymity if someone sees my file cabinet my mistake, and I don't have to re-label them every year. I keep any parent notes, tardy slips, nurse notes, example work I want to show parents, etc. and I always pull this out for parent conferences. - Make generic class checklists. A generic checklist will be used about a bazillion times. Field trip forms? Check. Money sent in for something? Check. Homework turned in? Check. I also keep one in the cover of my binder at all times, and one in my emergency bag that I grab for drills. Alphabetical order with class numbers works best for me! Don’t make a lot of copies yet (because class lists ALWAYS change in the first week or two) but tweaking a name or two on the form is much easier than typing it all up once school has started and you have a million other things to do! As soon as you have a specials schedule, this is so important! Put in the required things first, and don't forget about logistical things- bathroom break after lunch, for instance. I use Google Calendar to quickly move things around where I want them before I stick it in a Word document. - Use this schedule to set up your planbook. Of course, I love my lesson planning pages in Word. Hopefully, you read about my lesson plans, picked up a free starter plan template to customize, and then read my tips for personalizing your lesson plans. Print out a few for the first few weeks- you'll change and update them after that. Look at your report cards and ask other teachers what sorts of data you are required to keep, if you’re a new teacher. Is spelling part of "Language Arts," or is it a separate subject? I like to use a digital gradebook because it makes calculations easy and I can access from home or school. Engrade is super easy for inputting grades on the iPad, which I love. I can also weight categories without doing the math by hand. - Make yourself a teacher binder. If you don't know my love for my organized teacher binder, welcome. You must be a new reader. I promise you- this thing is my number one, top, favorite item for keeping myself organized. Make sure it includes all of the things you will need with you around the school (staff meetings, computer lab, copy room) and at home (calendar of school events, planning pages, standards/ planning documents). - Set up a calendar. I really like to put mine in my teacher binder! Unless you DON'T tend to pile things on your desk, don't try a desk calendar. Believe me when I say that it will end up under a stack when you need it, and then you won't write something down, and then later you'll forget about it because you didn't write it down... basically, if it's covered up very often at all, it's already not doing its job as a calendar. I do like Google Calendar a lot, but I don't have a smartphone and therefore Google Calendar is not always with me. If you are looking for a printable calendar, like I was, there are a few beeeautiful freebie options on the internet. The tricky thing about that is that most of them are only released by calendar year. Not only does it not match, but I also don’t usually have the January- May calendar to use yet early in the fall and it makes it harder to plan ahead. 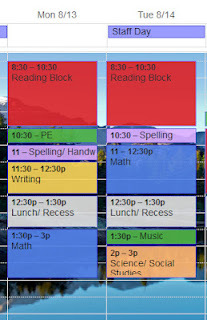 Problem solved- a school year calendar that’s colorful, but not too much color ink to print. For a limited time (until next Monday, June 17), I’m going to offer this FREE to Facebook fans. You can ‘like’ my page here, or by clicking on one of the photos below. Now that the freebie is done, you can purchase this calendar for $2 here! Make sure you go through the school calendar and add the big dates- school breaks, meetings, etc. I also like to number the weeks of the school year for my planning! 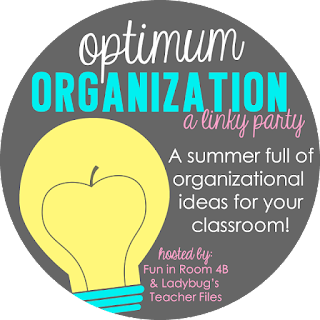 and linking up with two of my favorite blogs, Ladybug’s Teacher Files and Fun in Room 4B for their Optimum Organization linky party this week! A little organization before the school year can go a long way toward keeping you organized during the school year! What sorts of things do YOU do to pre-organize for your new class each fall? Username and Password Reference Sheet Freebie! It’s been a busy few days! I think I’m still in denial that I don’t yet have a classroom for next year, because I keep pinning classroom ideas and having to talk myself out of school shopping. We just got back from a few days of staying with in-laws and apartment shopping in our new area. Thankfully, it’s only about 3 hours away, but with summer school starting up tomorrow and moving time coming up quick, we needed to check out places to live pretty fast. 21 properties in 2 days, but we just heard back that we were approved for our top choice so we officially have somewhere to live! I don’t think a vacation (well, one longer than a weekend) is going to happen this summer… but when I do go, I have to have some great books, my camera, and a GPS. I’m notoriously bad with directions! Any book suggestions for this summer? :) I tend to enjoy deep books that are intense and make me cry, because I'm a weirdo like that! But some fluff is always fun too. 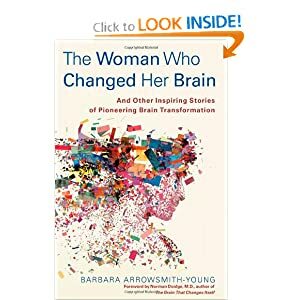 Right now I'm reading this one, which has some interesting brain stuff that I'm LOVING as a teacher. In other news, I'm getting started packing up my room. Last year, I posted Ten Things Every Teacher Should Do at the End of the Year, and I'm working on one of them right now- writing down my computer logins and passwords so I don't forget them by August! I decided that I should put these in my teacher binder, so I made a cute template. You can grab it for free here. Whew- teaching summer school and planning an out-of-state move in less than 3 weeks is wearing me out... but happy Friday! This is the first summer since high school that I haven’t worked full-time, and so far I am loving a little bit of time to unwind. I start summer school next week, and from there life speeds up VERY quickly until our move- but I’m still excited for the summer, and I had to link up my ABC’s of Summer! I have a lot to get done this summer, but I’m hoping to spend some time trying things on my Pinterest boards, getting myself in shape in a fun way, and spending time with family and friends (especially before I move! I’m also going to give this TpT selling thing a try, so be sure you’re following me at my Facebook page and my TpT store!